GTA chief executive Bimal Gurung today sought the state government's co-operation and said "politics and development should not be mixed" in an apparent attempt to reach out to Mamata Banerjee with whom he had a strained relationship in the past few years. "I have congratulated Mamata Banerjee after her party secured absolute majority in the recent Assembly polls. We seek co-operation from the state government in the future and hope there will be appropriate response from its side," the Gorkha Janmukti Morcha president, Bimal Gurung, told journalists before boarding a flight from Bagdogra for Delhi this afternoon. He said he would attend Mamata's swearing-in in Calcutta on May 27. "I am going to Delhi for a personal visit. Its for some medical purposes. Tomorrow, I will reach Calcutta from Delhi and attend the swearing-in. Morcha MLAs will also be present." Asked about the differences between the Morcha and Trinamul, Gurung said: "Politics and development should not be mixed. We want the state to co-operate with us and we will see what the response will be in the coming days." 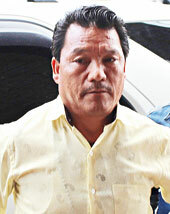 Observers said Gurung's comments indicated his willingness to improve relations with the state government. "In the past two-three years, the GTA chief has been consistently critical of the state government. Mamata's decision to form development boards for different hill communities had prompted Gurung to launch a scathing attack on her. He went to the extent of alleging that Mamata was trying to divide the hill population. Gurung also accused the state government of interfering in the functioning of the GTA and not transferring departments to the hill body," said an observer. "Now that Trinamul is back in power and Mamata Banerjee will be the chief minister for the next five years, Gurung deems its proper to keep Mamata in good humour. He has clearly understood that the GTA cannot function in a full-fledged manner only with the help of the Centre and he needs the co-operation of the state too. That is why he is attending Mamata's oath-taking and seeking her co-operation." Gurung today said the Morcha would stick to its principal demand of Gorkhaland. "We are not dropping our principal demand and will continue to pursue it. We have seen the results of the Assembly elections (in the hills). It has been decided that we will soon prepare a comprehensive strategy on future political activities," said Gurung. Compared to 2011, the Morcha's vote share has plummeted by 50 per cent in 2016 Assembly polls. "This is another cause of concern for the Morcha. Considering Mamata Banerjee's focus on the hills in the past five years and the announcement of infrastructure projects, not to mention the formation of development boards, it has become clear to the Morcha that the separate state demand alone will not be enough to help the hill party secure majority at the GTA. This is why Gurung wants to restore the cordial relations with the state," said the observer.